It's the year 3587, conflict spans the stars. Huge robot armies are locked in an enduring stalemate. In their bid for galactic conquest they call upon the most powerfull group of mercenaries in the universe: the Awesomenauts! It's the year 3587, conflict spans the stars. Huge robot armies are locked in an enduring stalemate. In their bid for galactic conquest they call upon the most powerfull group of mercenaries in the universe: the Awesomenauts! Awesomenauts is a really fun 2D sidescrolling take on the MOBA genre that hit things pretty hard when it launched and has been getting massive updates since. This year it went entirely free to play and now is getting a huge update making freemium game progression easier and giving people more things to do. This latest update also introduces Daily Missions. These missions challenge players to complete matches with a specific type of character, to claim victory in a certain number of matches, or to fulfill another objective. The reward for completing these missions? 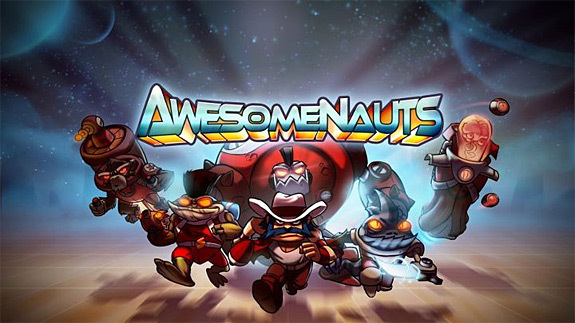 Sweet, sweet Awesomepoints that players can use to purchase additional characters or... Read All Awesomenauts is a really fun 2D sidescrolling take on the MOBA genre that hit things pretty hard when it launched and has been getting massive updates since. This year it went entirely free to play and now is getting a huge update making freemium game progression easier and giving people more things to do. This latest update also introduces Daily Missions. These missions challenge players to complete matches with a specific type of character, to claim victory in a certain number of matches, or to fulfill another objective. The reward for completing these missions? Sweet, sweet Awesomepoints that players can use to purchase additional characters or unlock other cosmetic upgrades. In addition to these new gameplay features, we’ve also further refined the experience for players who are new to Awesomenauts. To welcome these new players into our community, we’re providing them with new features that help them predict the effective range of their abilities, and are providing them with a set of daily missions that help them explore the various features Awesomenauts has to offer. We're sure many of these changes will also benefit veteran players who are experimenting with newer characters or returning to the community. Awesomenauts is one of the more accessible MOBA's i've played and if you are looking for a fun free game to play with your friends online or at a LAN, you really can't go wrong with it. Awesomenauts Going Free to Play May 24th! 2D sidescrolling MOBA Awesomenauts has had a very long life and looks like it's getting a shot in the arm as it's going entirely free to play this coming May 24th! If you have the base game and all expansions you will get the new "unlock all nauts" pack which gives you access to all current and future Awesomenauts. They are also adding a new currency Awesomepoints you get by gaining experience you can use to unlock new Nauts, customized droppods or portraits. Nearly every MOBA is free to play and this update makes sense with the kind of game Awesomenauts is and I hope the community is open to the change. In 2013 we... Read All 2D sidescrolling MOBA Awesomenauts has had a very long life and looks like it's getting a shot in the arm as it's going entirely free to play this coming May 24th! If you have the base game and all expansions you will get the new "unlock all nauts" pack which gives you access to all current and future Awesomenauts. They are also adding a new currency Awesomepoints you get by gaining experience you can use to unlock new Nauts, customized droppods or portraits. In 2013 we interviewed Robin Meijer from Ronimo games about Awesomenats and I pictued him certain Awesomenauts matchups with other fictional characters that is well worth a read. After Humble Bundle 8 dropped I picked it up and after thinking it over decided to play Awesomenauts first. I had heard from people on the site that this is a good game, plus I see people playing it on Steam all the time so I figured it was time. While I was at University I played a fun Warcraft III UMS map called Defense of the Ancients. That made it into our LAN rotations among other Tower Defense maps and regular ol' War III. I really dug DoTA but never was exceptional at it. Fast foward to today to the more modern DoTA 2 and League of Legends and whereas the core idea is fun, the immense difficulty ramp is not. Intro Awesomenauts. It comes packed with all the Tower... Read All After Humble Bundle 8 dropped I picked it up and after thinking it over decided to play Awesomenauts first. I had heard from people on the site that this is a good game, plus I see people playing it on Steam all the time so I figured it was time. Intro Awesomenauts. It comes packed with all the Tower / Hero destruction fun you could want in an easily accessible game. That doesn't mean the game isn't challenging, but it doesn't throw you straight into the pits of hell to start. The game starts with a simple tutorial that covers how to play as Lonestar, a good overall character. From there you can head to practice matches against bots. As you play matches you gain EXP that unlocks the other characters in the game as well as other arenas to fight in as well as some special attacks. The first few matches I played as strictly Lonestar and then Gnaw & Derpl Zork. Derpl Zork and Gnaw are really fun. One thing worth noting is that Awesomenauts is playable on Mac, Linux and Windows such that when you pickup the game later on another OS your progress is saved. I imagine it employs some cool Steam cloud wizardry and it works very well for you all that bounce between multiple OS's like I do. Head over and nab the recent bundle to get a slew of other great games and... Awesomenauts. Oh and if you are into Awesomenauts, checkout our Cheerful Ghost event on Friday for the game! A very fun game! I really enjoy playing as Voltar. He's a healer, but when powered up, can do good damage as well. Pair him up with Derpl Zork and become a wave of destruction! Yep, that combo was so much fun. God bless Derpl Zork. I've been curious about it. It looks like loads of fun. My brother had it while I was staying with him this summer. It was a good time, especially once I figured out what the hack I was doing. I enjoyed the stealth character. From the trailer it looks like a Saturday Morning Cartoon similar to Super Smash Brothers? More like Contra meets DOTA. I vouch on this. This is an extremely fun game with updates still being made! I recommend any of you guys get it. I just picked this up in the recent bundle and your right BR, this game is very good. Pickup and play is high and its very fun. WAY more accessible than typical MOBA's too!